Larry Writer was born in 1940 in Olympia, Washington. He was commissioned through the Air Force ROTC program on June 10, 1963, after completing his degree in Biology and Chemistry from Washington State University and the University of Puget Sound. His first assignment was as a Research and Development Officer in Chemical and Biological Weapons and Defense at Eglin AFB, Florida, from July 1963 to April 1966, followed by Undergraduate Navigator Training at Mather AFB, California, from April 1966 to February 1967. Capt Writer was then chosen as part of a test program to use Navigators as Weapon Systems Operators in the back seat of the F-4 Phantom II, and completed Combat Crew Training at the Fighter Weapons School at Nellis AFB, Nevada in December 1967. He deployed to Vietnam in January 1968, and flew 7 combat missions with the 389th Tactical Fighter Squadron of the 366th Tactical Fighter Wing out of Da Nang AB, South Vietnam, before he was forced to eject over North Vietnam and became a Prisoner of War on February 15, 1968. After spending 1,855 days in captivity, Capt Writer was released during Operation Homecoming on March 14, 1973. He was briefly hospitalized to recover from his injuries and then requalified as a Navigator from May to June 1973, and flew C-141 Starlifters at McChord AFB, Washington, from June 1973 to January 1977, followed by Armed Forces Staff College from January to June 1977. 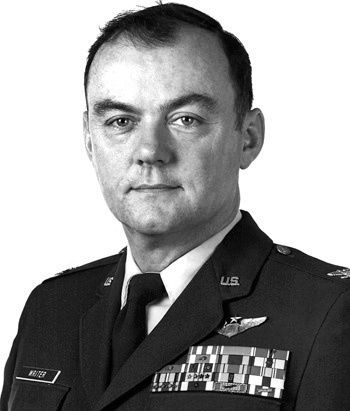 Col Writer next served at Headquarters U.S. Air Forces in Europe, where he coordinated air shows and special operations scheduling from June 1977 to June 1980, followed by service as base commander at Neubrucke AB, West Germany, from June 1980 to June 1982. He served as Deputy Commander for Resources (DCR) at Wurtsmith AFB, Michigan, from June 1982 to June 1985, and then at Fairchild AFB, Washington, from June 1985 until his retirement from the Air Force on September 1, 1987. After his retirement from the Air Force, Larry worked as manager of independent operators for Puget Sound Truck Lines from January 1988 to June 1994, business manager for the Suquamish Nation from June 1994 to January 1997, manager of blood pressure machines for Spacelab from January 1997 to June 2000, and manager of maps and records for Puget Sound Energy from June 2000 until his final retirement in May 2005. Captain Lawrence D. Writer distinguished himself by gallantry in connection with military operations against an opposing armed force as an F-4D Weapon Systems Officer in Southeast Asia on 15 February 1968. On that date, Captain Writer’s aircraft made repeated attacks against an armed convoy of forty trucks carrying men and supplies toward the Demilitarized Zone. Despite adverse weather conditions which necessitated extremely low-level passes in the face of intense, accurate antiaircraft fire, and with complete disregard for his own personal safety, Captain Writer’s aircraft damaged several trucks, setting four on fire, and succeeded in stopping the entire convoy. The courage and outstanding airmanship demonstrated by Captain Writer in stopping the convoy significantly degraded the North Vietnamese logistics capabilities. By his gallantry and devotion to duty Captain Writer has reflected great credit upon himself and the United States Air Force.